Hey everyone! 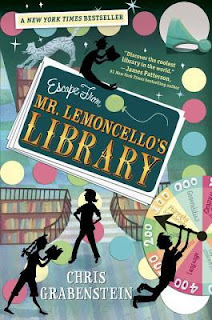 Late last year, I read "Escape from Mr. Lemoncello's Library" by Chris Grabenstein as a pick-me-up book. I needed something quick and refreshing, interesting and humorous, just to remind myself what got me into reading in the first place. So today, I'll be reviewing this Middle-Grade book. Before I jump into the main characters and story, as I usually do, I'd like to just put some information out there. Mr. Lemoncello was a famous game designer- board games and video games. Almost every child had played at least one of his unorthodox and quirky games. He was the donor to the new library that was sure to be the best library anyone had ever visited. Kyle Keeley was the youngest of three brothers, and in an attempt to beat them at a game, he got himself grounded. As such, he forgot all about the essay competition that would allow eight students to be the first to visit the library- similar to the Willy Wonka concept. His best friend, Akimi Hughes reminded him, and with persistence they both got selected for the tour. Along with them were six other students, including Kyle's enemy Charles. Charles had a tradition of winning, and he didn't want to stop now. After looking over the libraries amazing tech rooms, flying devices, holograms, fountains and endless books, the students were informed that the students who wished to stay would have twenty-four hours to attempt to escape from the library. This is where the story really becomes interesting, as some students team up, and others turn away competition. Filled with clues and humorous insights, Grabenstein's writing really appeals to a child. It has vivid descriptions and is often full of subtle hyperbole. Like many middle-grade books, the story ends in friendship, self-discovery and general happiness. The novel encourages students to find out what they're good at, and displays passions and interests at every possible opportunity, and could be really beneficial to shy students, similar to Grabenstein's character, Sierra. As for his writing, the author writes simply and humorously and you can almost believe that he was quoting children as he wrote. There is a sequel to this book. While I'm not excited to read it- because I usually read books that are slightly more complex- I am reserving the sequel for my next reading slump!